Published May 27, 2017, updated June 1st. Before I begin lets agree on what “naked middleweight” means. Naked means little or no plastic fairings; perhaps a small bikini fairing or flyscreen. In the 1970s middleweights were bikes in the 350cc-500cc range, with 650cc and up being BIG bikes. The definition has moved up and today’s middleweights are bikes in the 650c to 800cc range. I admit a personal bias – I’ve always felt that for solo, general purpose riding a bike with 750cc engine weighing 450 pounds or less is enough. One might need a bigger bike for two-up riding or long-haul touring to carry the extra weight of luggage in saddle bags and a tail boot. Fair enough, if you want a bigger bike I won’t argue with you. Now on to the story. Images are from the manufacturer’s websites. Every now and then a photo of a motorcycle will make my heart beat a little faster. This doesn’t happen often, but it makes me wonder: if I were still riding today what bike, or bikes, would I own? I recently an ad for the Moto Guzzi V7 III Special. What a nice looking bike. The iconic Guzzi fuel tank shape, strong horizontal lines on the bottom of the tank, extending along the bottom of the flat, dual seat. Also, the motor is RIGHT THERE to see, not hidden by plastic or a wide beam exterior frame. I guess I’m old school. As Bob Seger says, “Call me a relic, call me what you will / Say I’m old fashioned, say I’m over the hill.” I LIKE the way it looks. I wanted a closer look so I got onto the Moto Guzzi website. 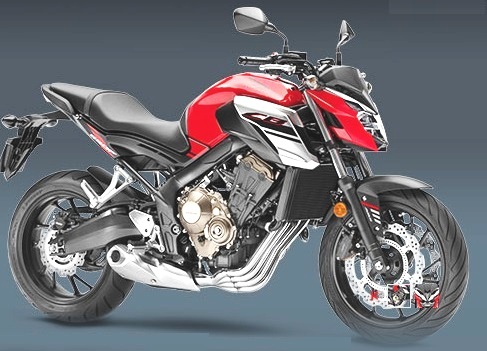 The V7 series are 750cc-class bikes and there are three models – the Stone, the Special, and the Racer. Bore and stroke are 80mm x 74mm for an actual 744cc displacement. It’s probably a coincidence but these are nearly the same as my 1974 Ducati 750 Sport (80mm x 74.4mm = 748cc). The Racer has café-racer styling, fancier paint, and upgraded rear shocks. You might think with my racing background I would go for the Racier but in fact I’ve always preferred more upright ergos on my street bikes. The Stone comes with a limited choice of colors on the tank but everything else is black, and there’s only one instrument. It might be an analog tach with a digital speedo in its face, or just a speedo. Not my cup of Chianti. The special has chromed exhaust and a few other polished pieces and painted side panels. It’s the one that made me look twice. Let’s take a look at the performance. I don’t expect much from a push-rod, air cooled, two valve twin, but 52 hp at 6200 rpm is pretty mild. With the 74mm stroke it should safely spin up to 7500 rpm, even with the extra weight of the push-rod valve train. 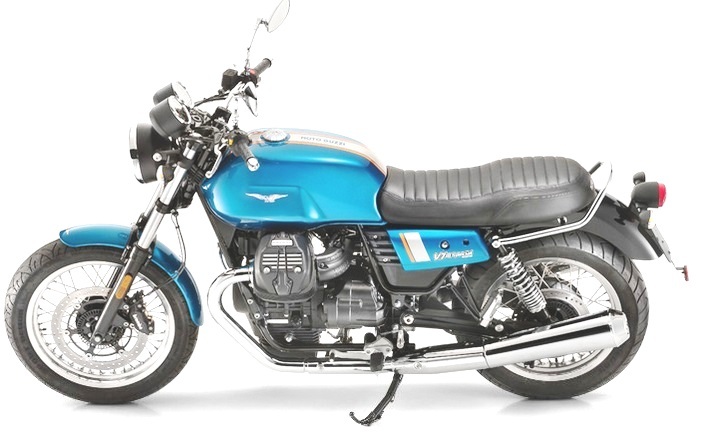 This means Moto Guzzi has tuned it for mid-range. 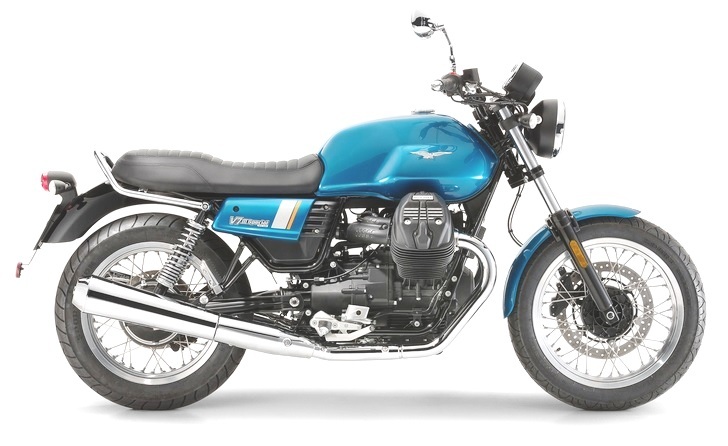 Moto Guzzi calls it a beginner’s bike but it’s not. Any bike weighing over 450 pounds with a top speed over 100 mph is no beginner’s bike. It has more horsepower than my old Honda NT650. I really liked that bike and I would hardly be considered a beginner. The V7 might make a good second bike. Other features include Brembo brakes with an anti-lock brake system as standard, three levels of traction control, and fuel injection. All good modern features. Older stuff: dual shocks, conventional forks, air cooling, two valves per cylinder, push rod valve actuation. A single disc on the front? Two would be better but one may be adequate given the docile tune of the bike. The V7 III is new and I couldn’t find any ride reviews on the web, but the V7 II was rated a good handler on smooth pavement. With an un-adjustable old style fork and twin shocks with only spring pre-load adjustment I would think bumpy pavement might give it trouble. An aside: the Stone has cast wheels while the upscale Special and Racer models have wire spoked wheels. I was under the impression that cast wheels were an improvement. You can go tubeless, for example. Can anyone explain this apparent contradiction? Part of the retro-styling? If I was still riding would I get a VIII Special? Maybe as a second bike, one for riding around town, or for rambling around in some of the nearby hills. It’s not cheap at $8,500 but that’s not too bad for a European. It sure is pretty, though. Just so this story doesn’t come off as a Moto Guzzi promo, let’s take a look at some other naked bikes in the 650cc – 800cc range. After a few years absent the SV has returned, and its reviews are good. The motor is a 90-degree V-twin, water cooled, double overhead cam, 4-valves per cylinder, fuel injected, with a six-speed transmission. It’s a thoroughly modern engine, with a claimed 64 hp and with 430 pounds weight it should scoot along nicely. It’s got a Ducati-like steel trellis frame, conventional non-adjustable forks and a mono-shock with spring preload adjustment only. There are double disc brakes up front, and ABS is optional. Styling is good. It’s not retro but rather runs along the current naked sport bike line. The Guzzi looks better but the SV isn’t bad. 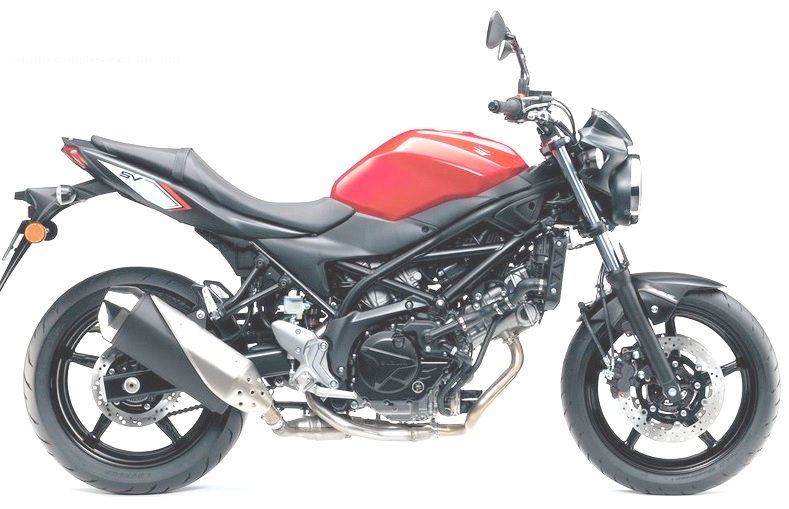 It seems like Suzuki did some price-point engineering with the suspension to put the SV650 at $7,000 ($7,500 with ABS). On paper this seems like a bike I might own, with some suspension upgrades perhaps. I’d rather it was a 750cc motor, not 644cc. This is, by all accounts, a fun bike. The motor is a 689cc parallel twin with liquid cooling, four valves per cylinder, double overhead cam, fuel injected, and claiming 75 hp. Interesting feature: this has a 270-degree crank. In the past parallel twins had either a 360-degree crank (pistons rise and fall together) or 180-degrees (when one piston is at top the other is at the bottom). This has a 270-degree crank, meaning (I think) when one piston is at the top the other is half way. It gives it the firing order of a 90-degree V-twin. It’s counterbalanced to prevent buzziness. Like the Suzuki it has a conventional, non-adjustable fork and a spring preload only adjustment for the rear shock. The MSRP is $7,200, $7,500 with ABS. Styling is, to my eye, rather odd. Dee looked at the image and said, “It looks like a bug.” The suspension seems not great but adequate. I don’t think this would be my bike. This bike has an 806cc in-line four cylinder motor, liquid cooled, DOHC, 4-valves per cylinder, six-speed gearbox. Suspension is a little better that most in this class, with an inverted fork with spring preload AND rebound damping adjustability, and a monoshock with rebound damping and adjustable spring preload. ABS is standard with the MSRP of $8,400. The website says “$1,500 Saving.” Does that mean the initial price was $9,900? 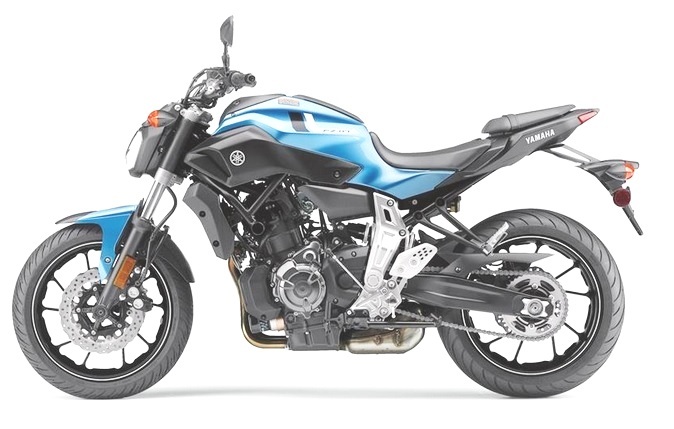 The website blurb says the bike has “Extreme Streetfighter Styling.” Is that what the Japanese are calling the bug-like look? The only color shown on the website is black with bits of green. The other significant spec is wet weight (oil, coolant and full tank of gas) is just over 500 pounds, a bit on the heavy side. I have a bias against in-line fours because when I was racing the Ducati in AMA Superbikes in 1978 the fours were so hard to beat. Not my bike. 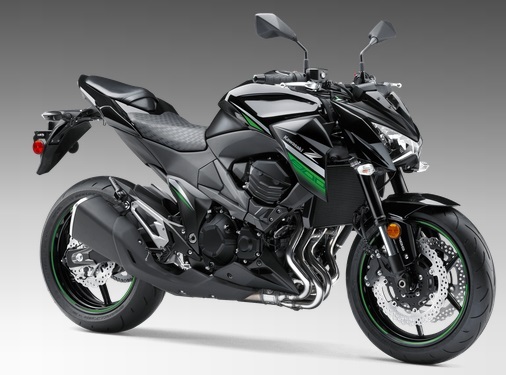 I just got word that the Z800 is being replaced by the Z900, which has more power and weighs less. That may explain the discount — it’s a closeout sale. That leaves the naked middleweight class covered by the new Z650. It’s a parallel twin, liquid cooled, DOHC,4-valves per cylinder, six-speed. Suspension typical of the class. $7,000 plain, $7,400 with ABS. Curb weight (claimed) 406 lbs. Like the SV650 it’s a 90-degree V-twin but with 100 more ccs. It’s European-expensive at $8,700 but on paper you get more for your dollar. The motor is liquid-cooled, with fuel injection, DOHC, 4 valves per cylinder, and a 6-speed transmission. It has a ride-by-wire throttle and three riding modes: Sport, Touring and Rain. The front forks are the USD type and aren’t adjustable but the rear shock has pre-load AND rebound adjustments. The front brakes are dual disks with radial-mounted calipers. 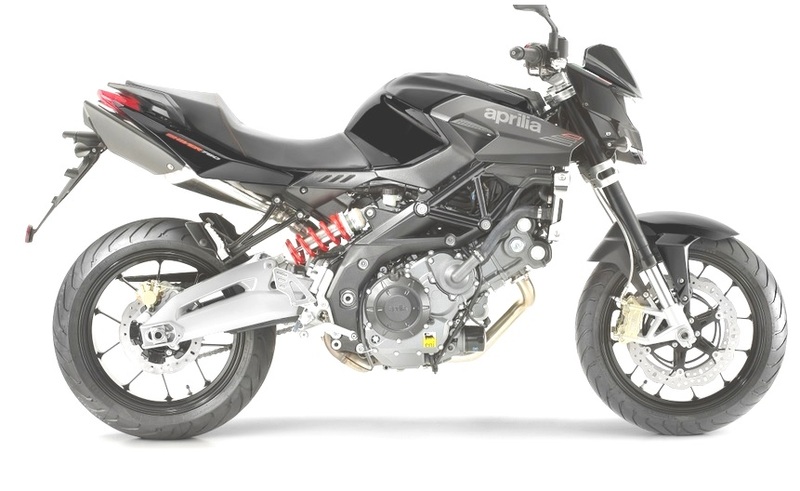 Aprilia claims 95 HP at the crank and a dry weight of 415 lbs. The thing ought to be quick. A road test by Rider magazine of a 2016 model showed 77.3 rear wheel HP and a rather pudgy 490 lbs wet. Can oil and coolant and fuel add up to 75 lbs? The website makes no mention of ABS, but reports are the European version has it so maybe it will be here soon. There are a couple if styling things I take issue with. Why does the top of the tank slope down toward the front? If they made the top level, or with a more gradual slope, it could hold more fuel, a good thing. Also the scooped saddle might make it hard to move around, and the pillion accommodation looks rather spartan. There are more bikes that fit into this “naked middleweight” class but I’m getting tired of browsing though websites and searching for road tests or ride reports. I’ll just list them and let you do the legwork if you want. Harley-Davidson Street 750. Feet-forward riding. It starts at $7,459 for basic black, more if you want color. Ducati Scrambler. There’s several models to choose from, all with an 803cc air-cooled, two-valve-per-cylinder, single over head cam engine. Reviews are favorable. They have retro styling that I like. Prices are below $10,000. I might buy one of these — I wonder if the 1000cc DS motor would slip right in? Triumph Street Triple, now with a 765cc 3-cylinder motor instead of the 675cc version. Three versions priced from $9,900 to $12,500. Lots of features, good styling, kinda expensive. Looks promising. KTM 680 Duke. This is a big thumper, a 690cc single cylinder motor. MSRP is $9,000. BMW F800R, with a 798cc parallel twin motor. MSRP is $9,995. That’s around a dozen different motorcycles (more if you count model variations), and I probably missed some. There’s V-twins and L-twins, parallel twins, a triple, a couple of in-line fours, and even a big single. List prices go from $7,000 to around $10,000 (if you don’t include the two most expensive Triumphs). It’s a good time if you like naked middleweight bikes.